Late the first night of San Diego Comic-Con, while so many of the con-goers were at the MTV Fandom Awards, I snuck away and managed to get into the extended panel for The Rocky Horror Picture Show remake. The room was full of fans and press who were anxious and nervous about the new production. The organizers were smart to begin the panel with a screening of the first 25 minutes of the musical. Everyone was jumping out of their seats to do the Time Warp and sing along with their favorite numbers. The preview ended perfectly after the introduction of Laverne Cox’s Dr. Frank-N-Furter, with a standing ovation that lasted several minutes. And the cast panel afterward consisted just of the stars talking about how much they loved the original film, with director Kenny Ortega discussing the process of bringing the cult classic back to the screen. This remake has a lot working against it and a lot to live up to — and it knows it. You either love or hate the original; and if you hate it, then you’re going to hate the remake. I re-watched the original shortly after watching this new version just to see how much they changed and how the two compare. It’s an incredibly faithful remake that recreates almost every single beat from the original. I really do appreciate the fact that FOX's Rocky Horror doesn’t veer far from the original script at all, changing only a framing device that pays homage to decades of the stage productions at screenings. Had they tried to venture into new territory, there would’ve been an uprising. This new framing device plus the casting of Tim Curry as the narrator allows audience interaction into the remake and the chance for extra doses of Curry throughout the narration. It’s the perfect way to pay respect to the iconic actor. Rock Horror is reverent of the original, while doing its best to reintroduce the iconic music to a new audience. Because there is specific audience for this musical, it expects you to have a working knowledge of the Rocky Horror mythology to fully get the jokes. The director has quickened the pace of the film because it’s not trying to build the suspense or surprise you with horror. It wants you to bask in the familiar yet meta world of these characters we love and let us spend more time with their carefully crafted personalities. There’s a self-awareness about just how much pressure is on this remake to live up to the original that it allows everyone to have fun in their roles and dig into the music and choreography. All the characters are played in a much more heightened way because of that aforementioned self-awareness. The actors get to delve into the sci-fi parody nature of the original even more and be as fun and silly as they want. New viewers won’t be lost, but they won’t enjoy it as much as the viewers that have a history with the material. The casting is the one thing that works well in this version’s favor. Having a woman in the lead — and a transgender woman at that — changes the dynamic. Queer women have always had more of an uphill battle than queer men because queer men have had more opportunity in media to be seen. It’s refreshing to see the gender bend and have that bend be portrayed by Cox, who is constantly fighting for representation and positive portrayals of transgender characters. She positively nails it and makes the role her own. Because Kenny Ortega directed this incarnation of the story, we get so much more wonderful choreography throughout the story, and not just the Time Warp. 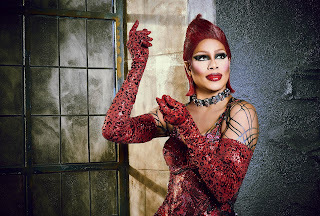 Cox makes Frank-N-Furter her own through dance and movement. Every step she takes is purposeful for the devilish doctor. Laverne Cox casting brings you to this new iteration but Victoria Justice, Annaleigh Ashford, and Christina Milian throw themselves into their characters, and bring an intimacy to them that makes you care. The remake is much more inclusive of actors on the spectrum and giving people of color a chance to shine in these iconic roles. This production of the remake is less visually dark and embraces the vibrant nature of this cult classic. The castle is so full of color and life, and makes it seem more inviting and tempting. It’s these careful and conscious visual choices which veer away from the original that make this remake worth watching. The script adds little tokens for the classic fans but does not really change anything outside of the framing. It knows what it is and what it’s doing, and it very much knows its place. The core of the Rocky Horror fandom is performers willing to go out there and give it their all and that’s exactly what this cast and production does. It embraces its queer identity and sexual liberation, and while it can only push the boundaries so far on Fox, it keeps the core camp and fun of the original sci-fi parody. Everyone deserves some joy and happiness after the presidential debates and this comes at the perfect time to provide the escapism the world needs. It’s a lot of fun and a great way to bring a new audience to this super queer musical. It’s not going to make a big splash like the original but it’s also not the 1970s, and the world has progressed with LGBTQA+ issues. It would be impossible to recreate the magic that came after the initial panning of the original film. If you’re looking for a good time and a great way to escape this dark election season for two hours, then this is the program for you. You cannot go in with a cynical heart, expecting it to be Boyhood, or for it to reinvent the wheel. It’s a perfectly fine tribute to the original film and the subsequent stage performances. While there is no way to top the original, The Rocky Horror Picture Show remake serves as a great introduction of the classic for younger audiences. It’s a good time in a familiar world. So sit back, relax, and do the Time Warp. I want those Laverne Cox portraits on the set. Can Christina Milian and Annaleigh Ashford please do colorful commentary of my life? Fox is crushing it with its live and re-imagined musicals. All other networks are going to have to really step up their game.